Why indeed? Jesus had advance notice. He knew what was going on. He alone had the power to prevent something like that from happening, as He had previously done for others. Hadn’t He healed Peter’s mother- in-law when she was very sick with fever? Didn’t He raise the little girl who was sick to the point of death with a simple touch and a word? Jesus is in the business of performing amazing miracles but why didn’t He perform it here? Why did He delay? Why wasn’t He here? A painful truth that we need to realise today is this: God doesn’t always prevent bad things from happening. We already know this just by reading the news. But sometimes it comes home to us in a way that is far too close for comfort. We lose people we love. We experience grief and loss. And like Mary and Martha, we grapple with the mystery: why didn’t God preserve our loved ones from death? Where is God in this scenario? I think we all feel moved, and even angry, when we encounter situations like this, and Jesus is no different from us in that regard. The text says that He was in “great distress” and uttered a “sigh that came straight from the heart.” The Greek word translated as “distress” is closer to the meaning angry. It literally means His nostrils flared; He snorted; He was angry. The text doesn’t tell us why, exactly, but we can imagine. Maybe Jesus was angry on behalf of all those who have ever died too young, angry for the same reason that all of us are angry when something like that happens. What kind of a world do we live in, that young people die and young families are homeless? He was angry at death and sin which is the ultimate cause of death! Martha tries to engage the Lord in a theological conversation about the resurrection of the dead on the last day, but He will have none of it. He just says that He IS the resurrection and the life, right here, right now. So Jesus goes to the tomb, makes them open the door, and He bellows. He demands that Lazarus comes out. The dead man hears Him and obeys. In John’s gospel, it is this act that finally tips the authorities over the edge and that which leads directly to Jesus’ own arrest and death. 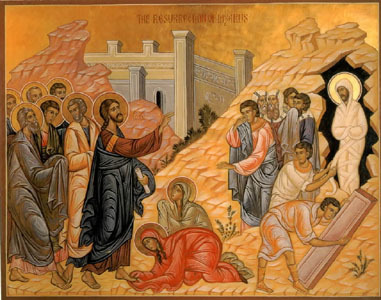 The story of the raising of Lazarus told on the threshold of Holy Week sets the stage of this event. This is the last straw, the last miracle of Jesus in John’s gospel, before His arrest and crucifixion. The Lord knew this would happen. He knew that if He broke this unbreakable barrier between death and life, between hopelessness and hope, it would push the authorities over the edge and make them do anything they could to stop Him. Which is exactly what happens. What I want you to realise is that by raising Lazarus from the dead, the Lord is saying this: I AM with you. I am willing to join you in your sufferings. When Mary and Martha say “Lord, if you had been here ….,” The Lord’s response is to say, I AM WITH YOU. When He is arrested, He is joining with all who have ever suffered, and saying, I AM WITH YOU. When He breathes His last and cries out and dies, what He is saying, to all those who have ever questioned His love and said “Lord if you had been here,” is, I AM WITH YOU. Jesus, Emmanuel, God-With-Us, joins us not by preventing death, but by dying with us and for us. He then begins the remaking of all creation by rising from the dead. The real miracle of the story is NOT the resuscitation of Lazarus, however impressive and important that is. Martha and Mary wanted a miracle, and they got their miracle. Their request was granted, their prayer answered. But St John tells us it is merely a sign, and signs point beyond themselves to something else, something more important and real. This is St John’s theme throughout the gospel. The Lord feeds 5,000, which is the sign; but the point is that He is the true bread, and if we feed on Him we will never be hungry again. Then, He offers life-giving water to the Samaritan woman, but He is the true font of eternal life. The Lord then gives sight to a blind man which we heard last week; but He is the light of the world. Finally He resuscitates Lazarus, the last and the best sign; but the greater truth is that Jesus is not just a miracle worker, He is the resurrection and the life! Miracles are nice; but they don’t solve our deepest problems. Yes, on balance I would rather have a nice life than a miserable one; I would rather live a normal life than a tumultuous one; I would rather be healthy than sick. But in the end none of us will have as much control as we would like. We will suffer losses; our children will experience pain and disappointment; our lives will not go as planned. Life will not turn out as we had imagined, expected, and hoped for. As much as we want Him to, God will not perform on cue. Jesus Christ offers something more and definitely better. Not a nice life but a new one. He promises us not a long life but far better than that, an eternal life. He is the real miracle of the story. He is the final and ultimate answer to prayer. He is the resurrection and the life. Not resuscitation but resurrection. Not reversal but renewal. Jesus defeated sin, death and hell. If we believe in Him—John’s point throughout the story—then we will have life; real, permanent, abundant, substantial, eternal life. If we die, we will still experience that life. But even now we can experience that life because it is bigger than both the life that we know and the death that we dread. “I am the resurrection and the life. If anyone believes in Me, even though he dies he will live, and whoever lives and believes in Me will never die.” Then the Lord adds, “Do you believe this?” Do you believe this? It is my hope and prayer that everyone of you would get it right. “Yes Lord, I believe that you are the Christ, the Son of God, the one who was to come into this world.” AMEN!